Click here for Part One of this post. Despite the gorgeous, wistful, evocative language here, the opening image of “the lost baby poem” is grim: the narrator has flushed a fetus down the toilet. This connection also calls attention to the fact that the majority of women who choose to end their pregnancies are already mothers, many of them in dire financial situations (“you would have been born into winter / in the year of the disconnected gas / and no car”). 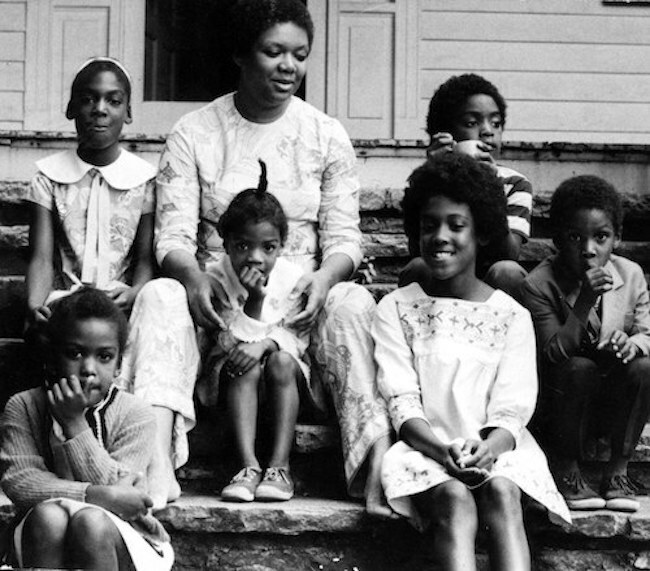 Clifton with her six children, late 1960s. The most beautiful aspect of “the lost baby poem,” for me, is how it allows sadness to exist without regret. Or rather, it makes space for regret without the simultaneous wish to have made a different choice. Sylvia Plath drafted “Parliament Hill Fields” about a week after her miscarriage, in February 1961. In the middle of a bleak English winter. Parliament Hill Fields was, and is, part of Hampstead Heath, a public green space about a mile from the London apartment where Plath lived with her husband, the poet Ted Hughes,*** and their ten-month-old-daughter Frieda. On this bald hill the new year hones its edge. The round sky goes on minding its business. Nobody can tell what I lack. Despite the claim of inconspicuousness, the jarring, marbles-in-the-mouth quality of the line “Your absence is inconspicuous” calls attention to itself. Makes itself known. In a challenge to public silences and shame over a common occurrence, Plath asserts, vocalizes, attempts to make visible that absence, at least for the span of this walk, for the space of this poem. The old dregs, the old difficulties take me to wife. I enter the lit house. Plath with her two children, early 1960s. Unlike in Alice Flaherty’s The Midnight Disease, there’s no personal loss at the center of this story. ***** No private grief that sent me wandering down the corridors of Hades, or Limbo. Having stumbled unexpectedly onto this topic, having followed my reckless curiosity, Ulysses-like, past the bounds of good sense, I wonder if I have any business here, in the Land of the Grieving. I feel like a child who has wandered absentmindedly into a room full of grown-ups speaking of serious subjects in hushed tones. Or a tourist trespassing on sacred ground. Maybe my presence is unwelcome. Or, maybe (the superstitious part of me pipes up again) I am inviting tragedy by writing about it. Reading about the artist Frida Kahlo shifted the direction I was on, toward a thornier path but at least a less gloomy one. I had started out investigating the relationship between loss, including pregnancy loss, and the drive to creative expression. Then, I happened upon Devouring Frida, a book that debunks some of the myth and BS that clings to the iconic Mexican self-portraitist, 65 years after her death. Devouring Frida got me thinking about stereotypes around grieving mothers, as well as around the idea of grieving Motherhood itself. The arm that holds a palette is overseen by a weeping moon…. The blood of Kahlo and her fetus fertilizes the growth of strange new creatures, half plant, half organ. 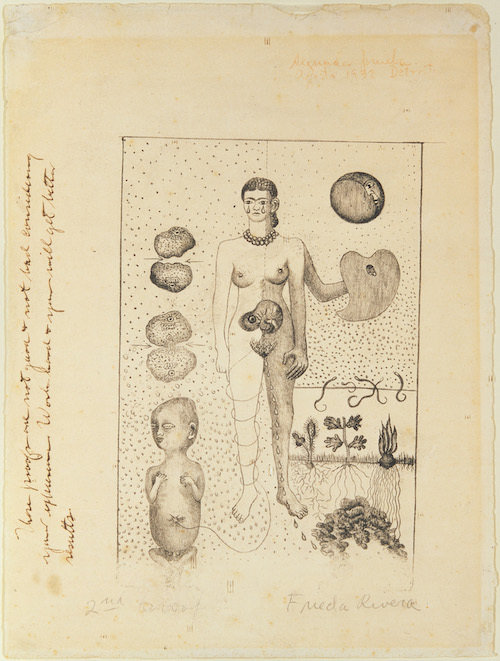 Flaherty, in sum, reads Kahlo’s miscarriage as the motive behind her artistic expression—a thwarted desire for motherhood translated into a strange, and strangely beautiful, new art. ﻿It turns out that this piece has a more complicated history. Although the lithograph has been called “El Aborto,” “Frida and the Abortion,” “Frida and the Miscarriage,” or “The Miscarriage,” Kahlo never actually titled the lithograph (!). Instead, it is museum curators and art critics who have posthumously named the work, and who have linked it explicitly with Kahlo’s 1932 pregnancy loss. These titles, in turn, shape our interpretation of the lithograph. Given my health, I thought it would be better to have an abortion…. I am willing to do what is most advisable for my health…. Do you think it would be more dangerous to have an abortion than to have a child? The letter moves into other, non-medical factors for considering an abortion. Far from home, she has no family and support in Detroit. She is unsure her husband is interested in having a child, given his immersion in his work. The industrial American landscape of Detroit in the background further suggests a world beyond the private and self-referential. Perhaps it offers a critique of capitalism, or of the exploitative economic relationship between U.S. and Mexico? Either way, the painting covers more psychological and political terrain than a personal outpouring of grief. Frida Kahlo, Henry Ford Hospital (1932). ﻿As a literary scholar, I should have known better than to be seduced by the temptation to conflate art and life. To read a poem, or a canvas, as a window into the creator’s (pained) psyche. The artist does not equal her work. This is still true for work that plumbs the artist’s life for material, like Plath’s ‘confessional’ poetry, the identity-based verse of Clifton, or Kahlo’s self-portraits. In The Midnight Disease, Flaherty proposes this theory of artistic expression: that a need to express our suffering to others is at the root of creative activity. She argues that writing can be a form of healing, or at least an attempt at it. For many people who are grappling with a personal tragedy or a mood disorder, this may well be true. As mentioned in the last post, it’s been true for me as well: this site has become a vital outlet for articulating the minor losses and frustrations of early parenthood. But I’m not sure that loss, lack, a need unmet, fully or universally explains our motives in seeking out a creative life. This perspective, for one, doesn’t account for the joy that writing brings. At this particular juncture in my life, writing is also pleasure. Writing is a love affair. Writing is a vehicle for expressing curiosity about the world, for connecting to others, and for sorting through the tangle of influences and ideas within my own mind. I am persuaded, though, by the claim that we can’t easily separate our emotions and cognition, the feeling and rational parts of the brain. Becoming a parent has awakened such a vast range of emotions; this expanded emotional register has, in turn, fueled my writing. I’ve come alive from the detached, emotionally distant self that I had deemed the only socially acceptable attitude. I’m ready to be corny. Earnest. Angry. Vulnerable. My cards are all on the table. Motherhood—with its emotional highs, lows, and depths, its life-giving potential and also its darker, more destructive aspects—has given me something to write about. And yes, everything to lose. * Walt Whitman already claimed that moniker (“I am the poet of the body / And I am the poet of the soul”), but Clifton is an equally good candidate, IMO. *** Letters have recently surfaced suggesting that Hughes physically abused Plath two days before her miscarriage. The children…are lost to us over and over again, their baby selves smiling at us from photo albums like melancholy little ghosts of parenthood past. Where are those babies? They are here and not here. I want to remember the feel of a warm little hand in mine, or the damp, silky weight of a naked kid in my arms straight from the bath. When I prop Birdy on my hip, she still slings a little arm around my shoulder, jaunty as a boyfriend — but she’s so heavy. The kids grow and grow, they grow right out the door! …. Loss is ahead of us, behind us, woven into the very fabric of our happiness. ****** Lindauer suggests that, to an extent, the emphasis in post-revolutionary Mexico on traditional, child-bearing roles for women might have encouraged Kahlo to cultivate this impression that she was grieving motherhood. ******* There are even critics that posthumously blame Kahlo for losing the baby by not staying on the recommended bedrest!